In September 2015, the international community agreed a new set of development goals, the 2030 Agenda for Sustainable Development, comprising 17 Sustainable Development Goals (SDGs) and 169 targets. The number of people behind bars, whether on remand or serving sentences, has increased in most countries over the last 20 years, placing an enormous financial burden on governments and at great cost to the social cohesion of societies. In many countries, criminal justice systems are unfair and discriminatory. Instead of protecting society from crime and safeguarding the rights of those accused or convicted, they can cause, drive and deepen poverty and hinder social and economic progress. Goal 16 – on peaceful and inclusive societies, access to justice and accountable institutions recognises the importance of the rule of law to successful development. However, justice and penal policy reform are also relevant to and prerequisite for the achievement of several of the other Goals and associated targets (Goal 1 on poverty, Goal 4 on gender equality and Goal 10 on reducing inequality and discrimination, for example). 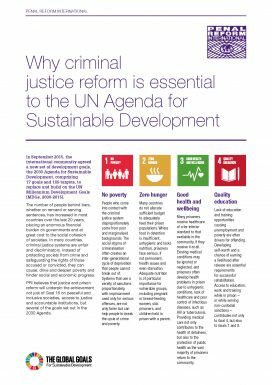 PRI has published a short briefing setting out how criminal justice reform needs to form part of member states’ Action Plans to implement the SDGs. As the Special Focus section of Global Prison Trends 2017, PRI published a longer briefing outlining in more detail how specific goals are related to the Sustainable Development Goals. Both briefings can be downloaded below.